Enough of the pies and pastries – bring on the poulet. 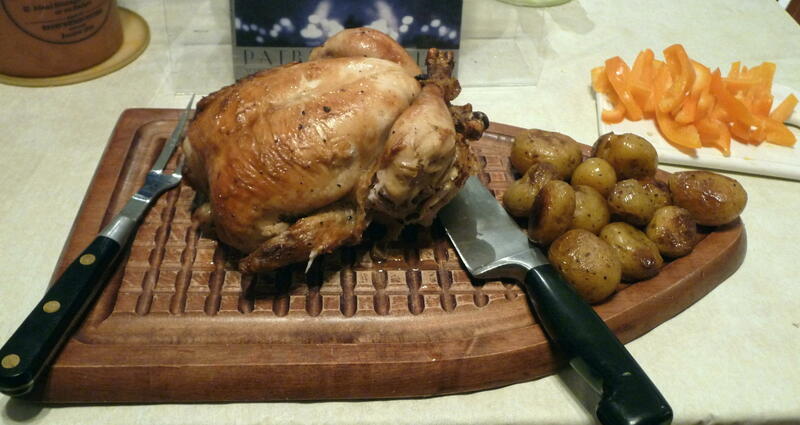 Freshly roasted, the chicken rests next to its recipe source. When I was a graduate student at La Sorbonne in Paris, I spent much of my time in food-related pursuits. Quelle surprise. 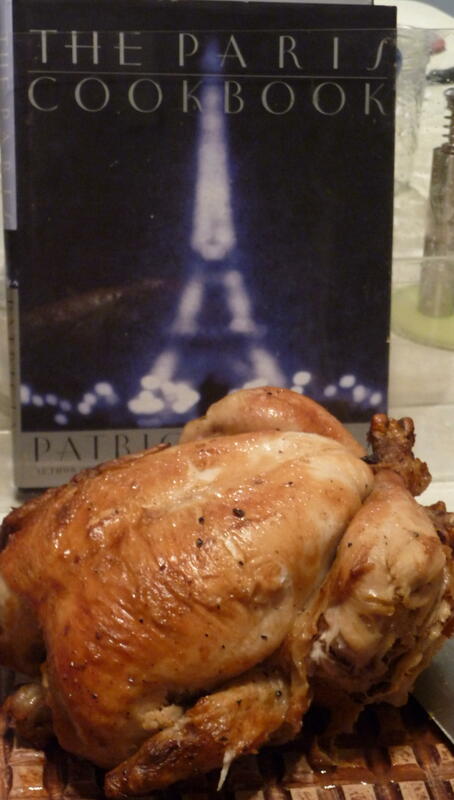 I relied on Patricia Wells’ Food Lover’s Guide to Paris (I think I had purchased the first edition before leaving for France). When I was in Paris, Ms. Wells was the food writer for the International Herald-Tribune, published in Paris. It was a great resource for me, in exploring the city’s markets, restaurants, and, of course, bakeries – so here we come back to patisseries again…no escaping this recurring theme for long. Macarons – 20 years or so before they became a global food fetish trend, I was chasing down the best across the City of Light. Ms. Wells’ book helped me to find the best things to eat, while discovering some more obscure parts of the city. I compared and contrasted the best examples, with the rigour a French literature student applies to l’analyse du texte. Besides, the best pastries were much tastier than the literature of the Middle Ages and Renaissance I was studying. Since then, Ms. Wells has garnered a justifiably international reputation for her knowledge and expertise in French cuisine. I have purchased some of her later editions of “food lover’s guides” and cookbooks. Her cookbooks are always engaging with the backgrounds and context of recipes, consistently well-written, and precise in the directions for all recipes, which always turn out well for me. After a brief rest, the chicken is now ready for carving.